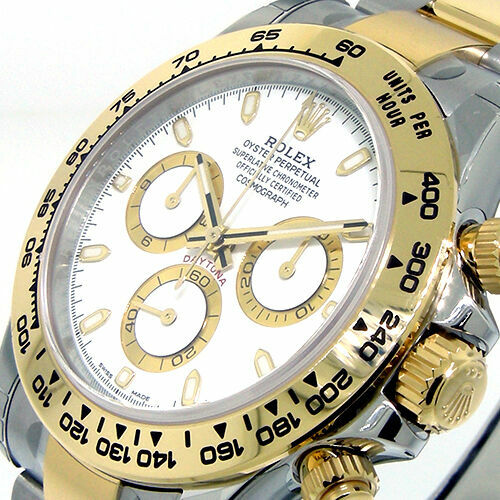 UNWORN Gent's Stainless Steel & 18K Yellow Gold Rolex "Daytona" Cosmograph. Item #: CT37026 Brand: Rolex Model: Daytona Cosmograph Reference No: 116503 Circa: Random Serial, Circa 2017 Production Gender: Gent’s Movement: Handmade Swiss Automatic Movement. Case Measurements: 40mm Dial: White Markers: Luminescent Baton Markers Bracelet: Stainless Steel & 18K Yellow Gold Rolex "Oyster" Folding Oysterlock Safety Clasp with Easylink Extension Link Bracelet. Features: Subsidiary Second Hand, 18K Yellow Gold Tachymetre Bezel, Chronograph Functions and Sapphire Crystal. Includes: Complete with Rolex Box, Booklets, Rolex Warranty Card, Hang Tags, and Capetown's Lifetime Watch Warranty.